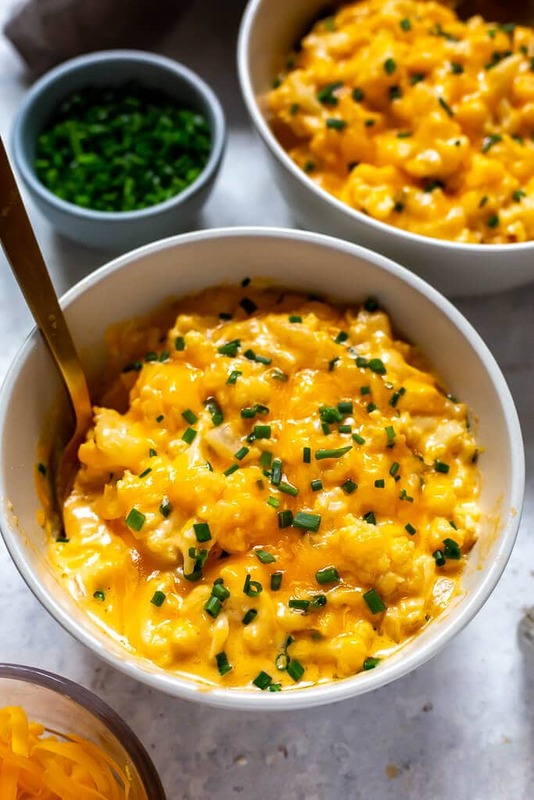 This Low Carb Cauliflower Mac and Cheese is a tasty keto spin on a classic mac and cheese – enjoy it as an indulgent, calorie-wise side dish or load it up with veggies and bacon for a full meal! 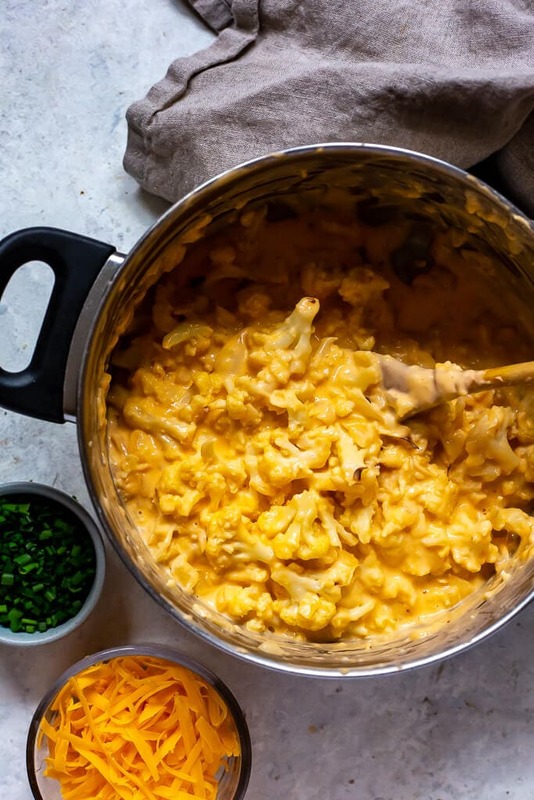 Now it's no secret that I'm a giant fan of Mac and Cheese – all you have to do is look at these recipes for my Instant Pot Mac & Cheese or this delish Butternut Squash Mac and Cheese. 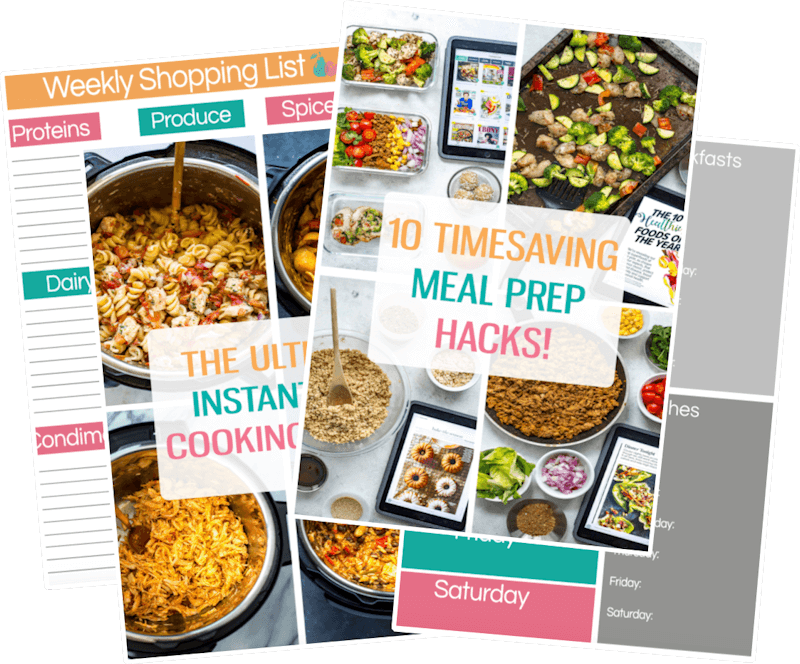 I have a few other mac and cheese recipes too, but I thought I should save you some scrolling LOL! Now I love a good old rich and indulgent dish like this from time to time, but I hate that you can't really eat it all the time! Between all the carbs and calories, it's impossible to indulge in your mac and cheese fantasies on a regular basis. 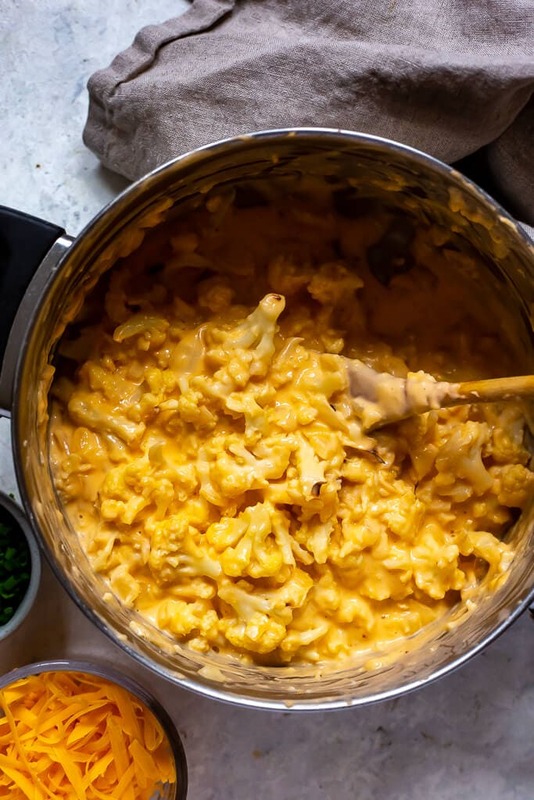 And that, my friends, is why this Cauliflower Mac and Cheese is here to save the day! 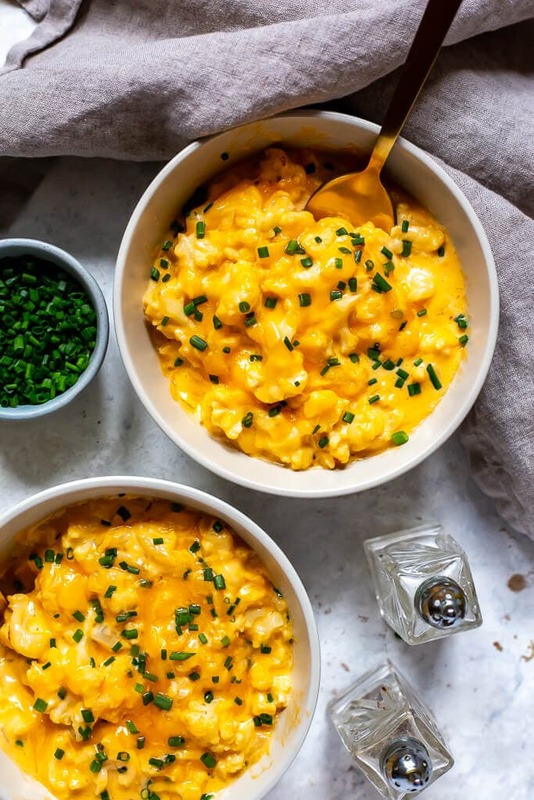 Now before you tell me that this is a glorified cauliflower in cheese sauce recipe, you should know that I've made a super easy and creamy sauce that is actually more reminiscent of mac and cheese itself. You basically want to roast the cauliflower and onions in the oven first, and while that's going, you'll whip up your luxurious cheese sauce! 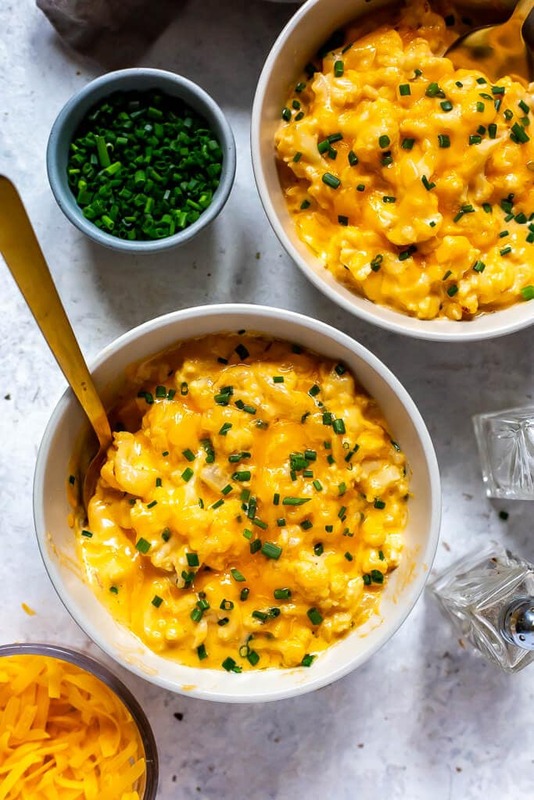 With just a few simple ingredients like butter, milk, cream cheese and cheddar cheese, you're on your way to cauliflower mac and cheese heaven! If you don't have cream cheese on hand you can also sub in 1/2 cup more cheddar cheese so no need to run to the store for special ingredients. I prefer to include the cream cheese because it leaves a smoother consistency and adds a bit more bit than it would without, but it's really up to you and your personal preference! I like to use 2% milk because that's usually what I have on hand in the fridge but any kind will work, even skim! You're only using 1/3 of a cup of milk to really focus on the cheese, and you don't want too much liquid because the cauliflower won't soak up the sauce in the same way that pasta will. You want just enough creamy cheese sauce to engulf your cauliflower but not leave it swimming in too much liquid. This cheese sauce is the perfect solution! 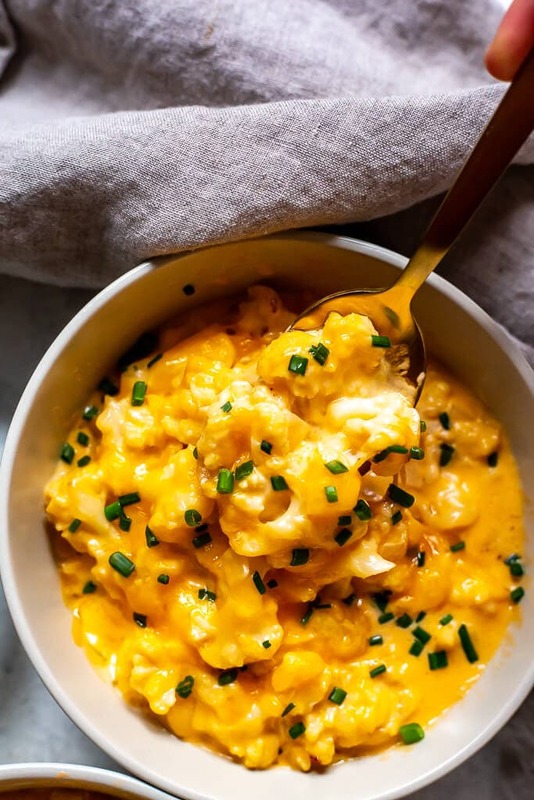 When I ate this low carb cauliflower mac and cheese, I actually ate it as a side dish along with some chicken, but it is packed with protein from all the cheese so you should still get a filling meal out of it. Personally, to fill it up a little bit more and make it a complete meal I would add in some ground beef or chicken breast or even some bacon as inspired by this Mac and Cheese Bar, and I always love sneaking in some extra veggies like broccoli, spinach or red pepper in. 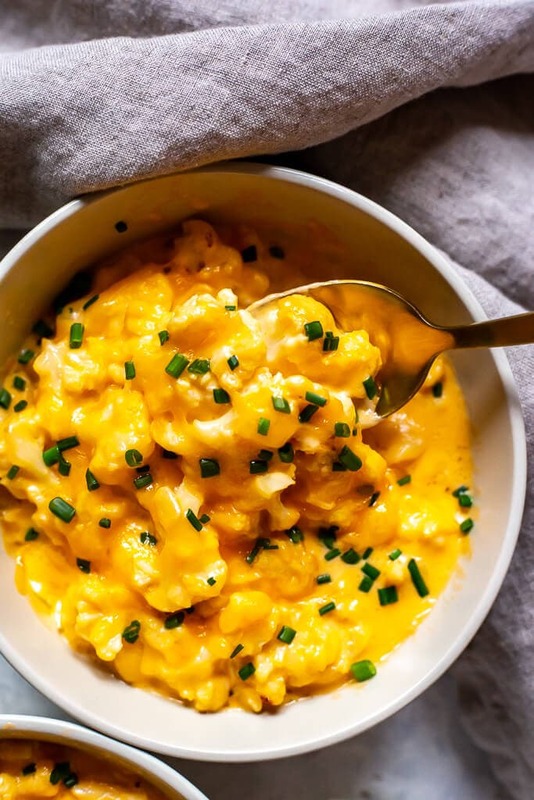 Don't be afraid to fully load up this cauliflower mac and cheese! Doesn't this big pot of low carb mac and cheese look absolutely irresistible?! 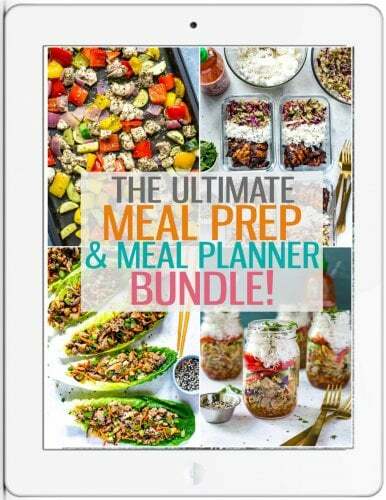 You've got to whip this up ASAP! 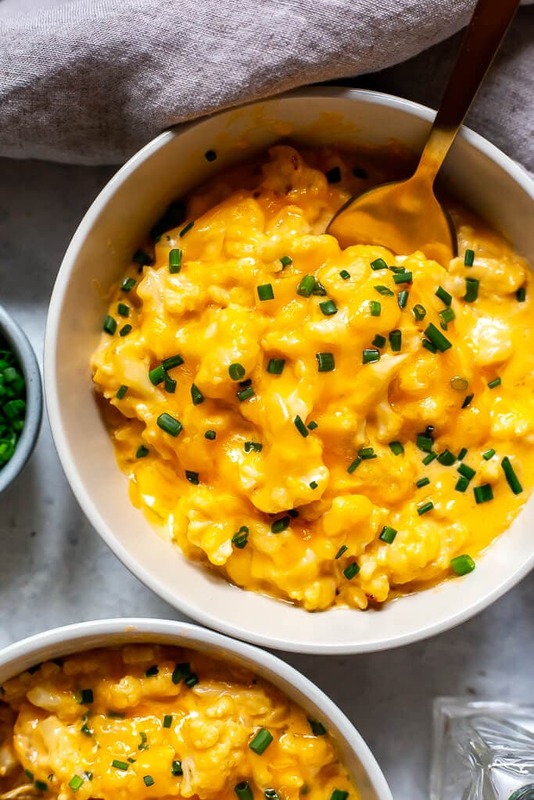 Will you be making this Cauliflower Mac and Cheese? Grab some glass meal prep bowls if you plan on packing this Mac & Cheese up for lunch! 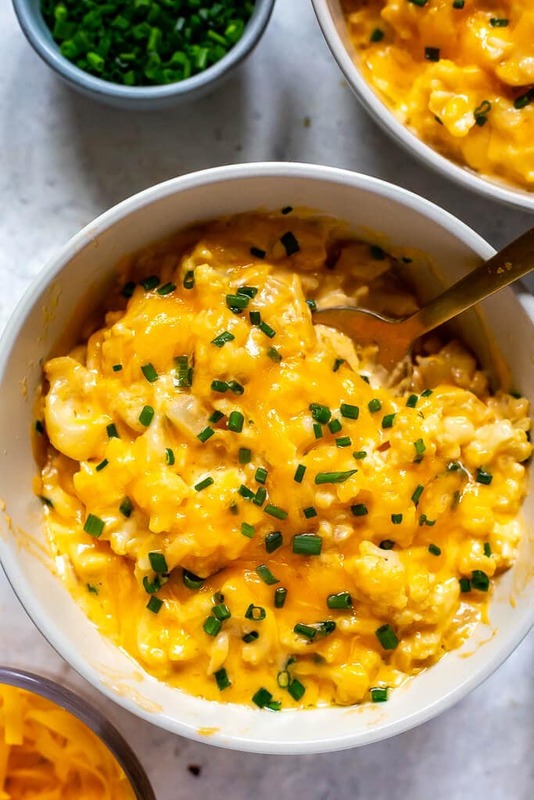 This Low Carb Cauliflower Mac and Cheese is a tasty keto spin on a classic mac and cheese - enjoy it as an indulgent, calorie-wise side dish or load it up with veggies and bacon for a full meal! Preheat oven to 450 F and line a baking sheet with parchment paper. Add cauliflower and onions and toss with olive oil, then season with salt and pepper. Bake for 20 minutes, flipping halfway through. While cauliflower is cooking, make the cheese sauce. Melt butter in a large saucepan, then add milk, cream cheese and cheddar cheese, whisking to combine and simmering over low heat for 4-5 minutes until smooth. Remove cauliflower from oven and toss in cheese sauce. Garnish with extra shredded cheddar cheese (optional) and chives then serve and enjoy! Generally I don’t Ike cauliflower…..ever!! But I really LOVE this recipe!!!! I decided to give it a whirl because I’m getting company this weekend and a lot of them are doing the Keto diet. This was soooo good!!! I added some crumbled bacon to give it a smokey taste since I will be making it with smoked meat in his weekend. I strongly encourage everyone to try this recipe!!! So glad you liked it Beth! !